The Canada-Poland Chamber of Commerce presented its first annual Award of Excellence to 19 recipients, including Alicja Wojewnik, founder and CEO of regulatory consultancy firm dicentra and online natural health product marketplace Vitarock.com. The Canada-Poland Chamber of Commerce of Toronto recognized economic achievements in the Polish-Canadian community at its first annual Excellence Awards Gala on May 23rd. They handed out Awards of Excellence to 19 recipients, including Alicja Wojewnik, for her regulatory and scientific contributions as the founder and CEO of dicentra and Vitarock.com. Also recognized at the event was newly-elected Mississauga mayor Bonnie Crombie. The award salutes members of the Polish-Canadian community for their outstanding contribution to the Canadian economy. The Canada-Poland Chamber of Commerce of Toronto, established in 1994, is dedicated to the promotion, development and expansion of business, trade and investment opportunities between Canada and Poland as well as the development of relationship and networking opportunities with other business organizations in Canada. “We wanted to provide a venue for people to be recognized for their contribution to business, with a focus on people who have achieved quite a lot… and contributed to the Canadian economy,” said Wojciech Śniegowski, Chairman of the Board of the Canada-Poland Chamber of Commerce of Toronto, of the awards, which were held at the Pearson Convention Centre. Alicja Wojewnik, MSc., arrived in Canada from Poland nearly 30 years ago. Leveraging her master’s level education as a microbiologist and experience working in a lab, Ms. Wojewnik secured a job at Jamieson Laboratories, eventually becoming Director of Science. She then went on to fulfill this role at Leiner Health Products and Genuine Health. Ms. Wojewnik was appointed by then Health Minister Allan Rock to join a Health Canada team to develop a new regulatory framework for health products, which is how the Natural Health Product Regulations of Canada came to be. In 2002, Ms. Wojewnik established dicentra – a regulatory consultancy firm that helps companies develop and promote natural health & food products in the North American marketplace. In 2013, Ms. Wojewnik founded Vitarock: an online marketplace featuring 1000s of products — from snacks, supplements, shampoos and creams to toothpaste and jewelry— all of which adhere to its strict standards as prescribed by Vitarock’s four pillars: Pure, Green, Safe and Fair. In 2014, the Canadian Health Food Association (CHFA) recognized Ms. Wojewnik for her leadership, passion and commitment to the industry by giving her the John Holtmann Leadership Award at the CHFA East Conference Gala on Sept. 17 in Toronto. Ms. Wojewnik’s companies are strong supporters of local and international causes, including The Polish Orphans Charity. 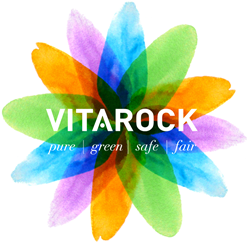 Based in Toronto, Canada, Vitarock is an online marketplace featuring 1000s of pure, green, safe & fair wellness products. Vitarock is the go-to shopping destination for ethically-minded people who want to make the world a better place while achieving wellness and joy in their lives. dicentra provides sought-after guidance and regulatory strategies for food and health-related products sold in North American marketplaces. Since 2002, it has been helping clients resolve difficult issues and meet the increasingly complex requirements of quality, safety and compliance. dicentra has advised hundreds of major, medium and small-sized companies, financial institutions, governments, associations, law firms and investors on how to bridge the gap between a successful, sustainable business and the required regulatory standards. dicentra has been directly involved in the successful development of hundreds of leading products in North America and worldwide.